✔	organisations of any size. ✔	collections of any size. 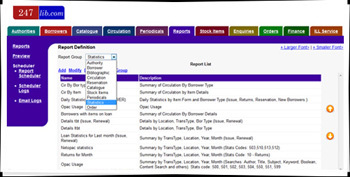 It is so easy to create your own report templates! Add your own colours, fonts, images and branding to add that wow factor! ✔	Ask our support staff to reconfigure your library management system without incurring onsite consultancy fees. ✔	The supervisor module comes with clear instructions, but you can always call us up if you have any queries. 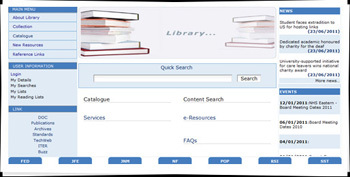 "247Lib.com is library management software, which provides an exciting robust web browser based interface. Configurations are available for charities, colleges, schools, health libraries, corporate libraries, law libraries, prisons, public libraries, government libraries and special libraries. 247lib.com is suitable for organisations of any size from those run by volunteers to large enterprises. 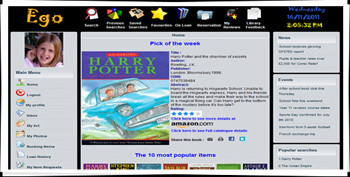 With its colourful web browser interface and clear screens with online help, staff and users find 247lib.com library software intuitive and easy to use. You can access your library and resources from anywhere including your school, workplace or home. 247lib.com will raise the profile of your library. 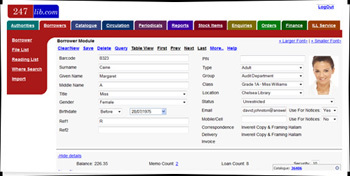 247lib.com configurations provide a complete integrated library management system with modules available for authorities, biometrics, book covers, bookings, borrowers/patrons, catalogue, enquiry management, finance and budgets, orders and invoices, periodicals, reports (emails, files and SMS), reviews and ratings, self-issue ( SIP2 ), stock item, supervisor, surveys and polls, z39.50. 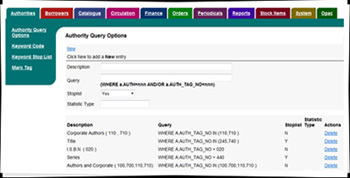 You can address any library management or resource management task by simply enabling the modules you want to use from the friendly web based configuration tool. 247lib.com may be hosted either at your premises or by third party hosters. 247lib.com is the only UK developed library management system, which has been approved on the government procurement website the G-Cloud. Microsoft and HP have both endorsed 247lib.com with '247lib.com in a box', which gives you a 'Microsoft Windows Embedded licence' ( a long-life unlimited user license from Microsoft) and a powerful server ( from HP). '247lib.com in a box' means that you can have a complete solution delivered to you including hardware, operating system and 247lib.com, which you just plug in - no awkward installation problems or installation fees. 247lib.com is the only library management system, which has been endorsed by Microsoft and HP in this way. If you are converting from an existing system, we’ll also take care of the data migration for you."